A Witney family friend, Francis knows more about William Witney than William Witney knew about himself. Known simply as Mike to the family, he has been a legal aid lawyer, a law school professor, an enthusiastic scholar of classic mystery fiction (particularly the work of Cornell Woolrich) and - for almost forty years - an accomplished author of short stories and novels. Now (2016)...the author of 'THEY CALL THE SHOTS' featuring William Witney as the greatest and # 1, we are proud to list Mike at the top of the list of WW aficionados. We would like to remember Jack as a William Witney and Maxine Doyle family friend. Certainly one of the great aficionados of Republic Picture days producing Valley of the Cliffhangers, Republic Confidential, and more. Without the help of Jack and Dene Mathis, William Witney's book, In a Door, Into a Fight, Out a Door, Into a Chase, would have never seen the light of day. Quentin's recognition of William Witney's work in a New York Times article says it all. Please read the archived article here. The official photographer for William Witney and family, photo journalist for the LA Times, lifelong film fan, and Lone Pine Film Festival photo aficionado. 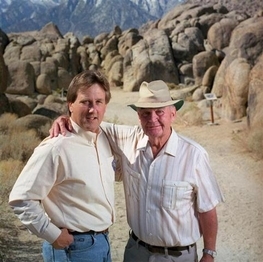 Pictured to the left is Don with William Witney in Lone Ranger Canyon, Lone Pine California in 1994. One of Don's photos of William Witney has been used as the header on this web site. 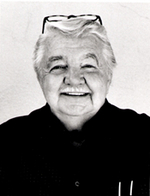 Boyd became a family friend after attending many film festivals with William Witney. Boyd owns and operates "Western Clippings", which is a publication for all Western TV and Movie enthusiasts. He is extremely knowledgeable about all aspects of western films and is a well known western film and TV series author, researcher, and publisher. We just happen to know that he is available in a variety of capacities to help you in your western related project.
" Boyd Remembers Bill Witney" click here. Drake is a family friend through his interest in William Witney's earlier work and article he wrote for the Screen Directors Guild Magazine. Jim is also a walking encyclopedia when it comes to vintage western films especially the ones directed by Bill Witney. Dave was not only a friend to the Witney family but also to many people in Lone Pine and around the world, being a co-founder of the Lone Pine Film Festival in 1990. 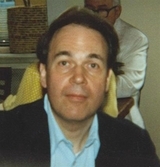 He was an author and film historian with a special focus on the B Westerns. More information about Dave's efforts to preserve the history of movie making in the Alabama Hills, Lone Pine, California can be seen on our Lone Pine page. Andrew is an expert on the TV series Bonanza and the episodes, which William Witney directed. He is also the attorney for David Dortort, the producer of Bonanza. He continues the legacy of the Bonanza series today. An expert on all those Roy Rogers pictures, and others directed by William Witney. He has written many articles for Western Clippings magazine and was co-author of "Smiley Burnette: We Called Him Frog". Information about William Witney while making Rogers pictures can be found in Richard B Smith III's new book "Roy Rogers-A Different View" co authored with Bobby J Copeland (2012). For information on how to obtain one of these new books email bobbycopeland@comcast.net. Tinsley is an expert on old western movie locations. His book "Those Great Movie Locations" proves just that and includes the locations used by William Witney. He has also penned many articles for Western Clippings magazine. 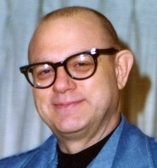 Angel is a true William Witney fan providing us with information, pictures and information about the early days of William Witney and Republic serials. When we first launched this site, Angel wrote to us to help attach names and places to the photos and told us " I have had a tremendous admiration for William Witney's work, and consider him my Hero above the likes of Roy Rogers, Gene Autry and John Wayne, because he was the one responsible for my enjoyment while watching the serials and westerns he directed." Ed Hulse...Film Historian and award winning Journalist. 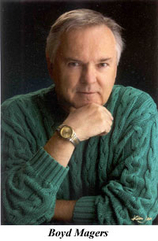 Ed is a film historian and has written and edited many books about vintage motion pictures and their stars.